Huron residents pose in front of a Chevy Volt with Executive Director of Valley LEAP and Huron Mayor Rey Leon (with straw hat). Photo courtesy Rey Leon. Rey Leon grew up in Huron, California. When he was a child, if his family or anyone in the community needed to go Fresno, his uncle would load them up in his Pinto and, for a fee, drive them the 52 miles to their destination. One day his uncle was called away to care for a relative in the hospital and the community was left without a reliable form of transportation. “We took a bus to visit the hospital in Fresno, and I tell you that bus (ride) was grueling,” he recounted of the three-hour ride. “And to this day it’s the same. Why do hardworking families have to [endure] it? That experience informs his work today as founder and executive director of San Joaquin Valley Latino Environmental and Advancement Policy (Valley LEAP) and recently elected mayor of Huron. Valley LEAP was one of two local programs recently awarded funding to provide sustainable travel options in rural Fresno County. Both projects will provide electric vehicles for ride-sharing in low-income, largely immigrant communities in western Fresno County. Valley LEAP’s program, which they are calling “Green Raiteros,” will serve the city of Huron. The Leadership Counsel for Justice and Accountability received funding for a vanpool program to serve the unincorporated communities of Cantua Creek/El Porvenir, which are 35 miles north of Huron. The funding came from the Just Transit Challenge, a competition open to anyone with an innovative solution on how to solve transportation challenges in the cities of Fresno and Long Beach. The Challenge also funded a third project in Fresno: the development of an app that will provide real-time transit information. “The raiteros provide a great service, but it’s not always cheap,” said Leon. In addition, the vehicles available to them are usually older models that are neither clean running nor fuel efficient. This is a huge problem for Central Valley air quality, which is some of the most polluted air in the nation, according to the American Lung Association. Leon plans to improve this model. Instead of old Pintos, the “Green Raiteros” will use electric vehicles. The program will also employ professional dispatching services, provide driver training, and pay a living wage to the drivers. The service is expected to launch at the end of summer. At first, it will only be available to take people from Huron to essential appointments like doctor’s visits in other parts of Fresno County. Leon’s project received $65,000 from Just Transit, which will go toward the purchase of two Chevy Volts. Valley LEAP also received $519,400 as part of a $4 million legal settlement resolving claims that an electric company overcharged some of its customers. That extra funding will help build charging stations along the corridor between Huron and Fresno. For its project, Leadership Counsel received $65,000 from the Just Transit Challenge, which it plans to use for a vanpool project. Called “Van y Vienen” (a nice play on words that means “they come and go”), the van will serve the unincorporated communities of Cantua Creek and El Porvenir starting this summer. Kaylon Hammond and Amanda Monaco of Leadership Counsel said the project builds on an existing grassroots network started by two local women. “People call them and ask ‘when will you go to Fresno next?’ and they pool their money together for gas,” Monaco said. These two small communities located next to each other are far from the nearest incorporated cities of San Joaquin (14 miles) and Mendota (22 miles), and 45 miles from Fresno. They are even more isolated than Huron, and lack grocery stores, medical services, and affordable drinking water. A school bus takes children to school in Tranquility, another unincorporated community twelve miles away. 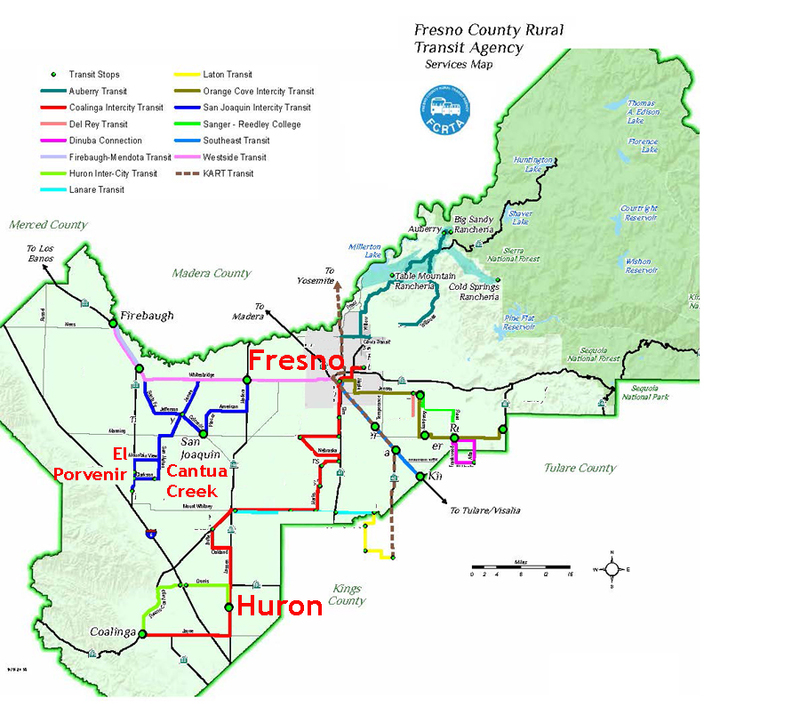 Fresno County transit maps show a bus stop in Cantua Creek and El Porvenir–see map below–but Leadership Counsel’s advocates say the community is not aware of it. “No one in the community knows about it, and elected officials don’t know much about it either,” Monaco said. This Fresno County transit map shows bus stops in El Porvenir and Cantua Creek, but few know the on-demand service is available. For the record, Moses Stites, general manager of Fresno County Rural Transit Agency, said transit service is available to residents, but that it is on-demand service. Residents in the communities of San Joaquin, Cantua Creek, Halfway, and El Porvenir call ahead for service to Fresno, Mendota, and Firebaugh. The Just Transit Challenge grant will provide driver education, insurance, a down payment on an electric van, and a salary for the driver until the program becomes self-sufficient. Blanca and Julia, the two women who started the vanpool, will continue to drive. “It’s great because they are already known and have a lot of trust in the community,” Monaco said. Monaco and Hammond said the vanpool program is a stop-gap measure; their long-term goal is to bring needed services to the community so people don’t have to travel so far. However, they hope the vanpool model can be an example for other communities to think outside the box. “In this community, in this country, there are people where the traditional modes of transportation [don’t work for them],” Monaco said. Dean from The 11th Hour Project agrees, and said these Just Transit Challenge pilot projects demonstrate the many possibilities for reducing emissions and making transportation more equitable. A new feature of the grant this year is the establishment of an incubator to help the grassroots grantees and other local groups that haven’t received grants work together and amplify their community work. “We are hoping these two grantees will be able to help each other through this endeavor,” Dean said of Valley LEAP and Leadership Counsel. The new train service is expected to stimulate ridership in the San Joaquin Valley and offer travelers with business in the capital an alternative to driving.